Last March 8, Yeng Constantino announced on Instagram account her engagement to her beau Yan Asuncion, vocalist of the band Indios. They sang for the first time as an engaged couple on ASAP19 today, March 9. 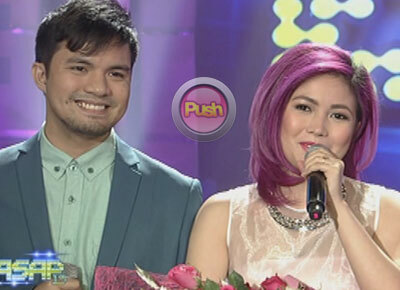 Yeng got teary-eyed as they sang lines from the chorus of the song “Your Universe” by Rico Blanco, “I don’t think that you even realize; the joy that you make me feel when I’m inside your universe.” The couple was both emotional throughout the song and after, when they recounted Yan’s proposal to Yeng. Yeng said that after watching the play “Rak of Aegis” with Yan, Sam Milby and some other friends, she asked Yan to go to a coffee shop with her, not knowing that Yan had been carrying the ring all day. Yan brought her to the place where they first dated and that’s where the proposal happened. Yan said, “Sobrang happy ako. I just love Yeng so much.” He added that he just knew that, “hindi ko na kaya to live another day na hindi ko masasabi sa kanya that I want to spend the rest of my life with you.” He said he didn’t even have to force himself to kneel because he just felt so weak in the knees and he had butterflies in his stomach. He then gave Yeng the ring given to him by his Mom. Yeng, on the other hand, assured her family that she will always be there for them even though Yan and she are going to have a family of their own.